It's no surprise that writer Bi Feiyu's novel The Moon Opera has been adapted into various art forms from small acreen TV dramas to big screen movies and even modern dance. However, people who have seen the trial performances in Shijiazhuang in Hebei Province in late September and the official debut at the National Center for The Performing Arts in Beijing from October 4-6, were surprised to find that the dance version presented by dancer Wang Yabin surpassed their expectation for a dance drama. A melding of modern and classic dance forms, The Moon Opera by Wang Yabin portrays both the stage career and emotional life of an opera performer, said a review by Beijing Youth Daily. 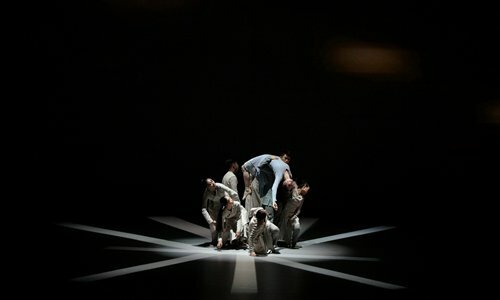 Praised for her work, Wang is currently staging the dance on Mondays and Tuesdays at the ongoing Shanghai Arts Festival. Wang recalled that it was in 2012 when she happened to read the novel that touched her heart and motivated her to adapt it into a new dance for her dance series. Before The Moon, Wang and her friends created six seasons of dances depicting various topics including Genesis and Dreams. The novel depicts the life of protagonist Xiao Yanqiu, who plays qingyi, the female role in an opera. On the stage, she is Chang'e, a fairy living on the moon according to Chinese fairytales. The novel shows Xiao Yanqiu's emotional conflict when she is forced to give up her beloved stage life for a more mundane job at a school and her revisting the pain when an expected opportunity to return to the stage is offered to her. In Wang Yabin's eyes, Bi's portrayal of Xiao reads like Chinese traditional acupuncture, accurate, sentimental and penetrating. Under Bi's pen, Xiao is so close to real life and it seems that "she is tailored to me," Wang said. Her choreography, direction and understanding of the role as depicted in her brilliant performance has won Wang acknowledgment from not only ordinary audiences, but also dance insiders. Wang Wei, vice president of the Beijing Dance Academy said Wang's The Moon mirrored real life and her use of the sleeve shaking technique effectively displayed Xiao's inner turmoil.